Participating in community activities is something that the members of District Council 78 in believe is an important component to building strong ties with our neighbors. District Council 78 Business Manager/Secretary-Treasurer and U.S. Navy Veteran Wally Ilczyszn worked with American Legion Post #142 Commander and retired U.S. Marine Marty Broderick to assist Ms. Elsie Charlton, a Pompano Beach, Florida, resident in her time of need. 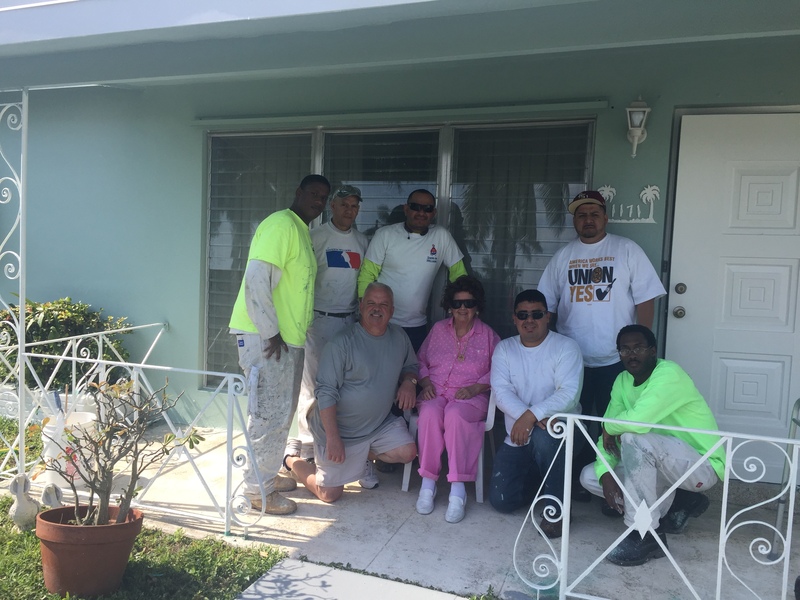 L to R: Apprentice Edward Diaz, industrial painter Jose Montanez, American Legion Post #142 Commander Marty Broderick (kneeling), Painting Instructor Wladamir Corrales, Ms. Elsie Charlton (seated), Coordinator Nate Aburto, Painting Instructor Josue Ubeda and apprentice Ike Vann. Volunteers for the project included DC 78 Coordinator Nate Aburto, Painting Instructors Wladimir Corrales and Josue Ubeda, journey worker Jose Montanez, and painter apprentices Eddie Diaz and Ike Vann. Together, they did an outstanding job completing the project. Ms. Charlton was overwhelmed with joy and marveled at the professionalism of the work performed. Special thanks to DC 78 for an outstanding job and giving back to military families and the community.